. . . Ballona Wetlands . . . Baldwin Hills . . . Dockweiler Beach . . .
Ballona Wetlands State Park is a park in the making. Alread 73 acres is state-owned. Another 193 acres is in discussion to be sold to the State. Add these two acreage figures together for a total of 266 acres. And at least 200 more acres is in other negotiation to be acquired. The biodiversity in one acre of Ballona Wetlands is higher than any one acre anywhere else in Los Angeles County. For example, more birds occur in one acre of Ballona than in one acre of the Santa Monica Mountains or San Gabriel Mountains. There is no other place in Los Angeles County that can claim to have 1,200 birds sleeping in one acre of land. During the five months of fall-winter months, 1,200 Black-bellied Plover sleep in a one acre area each night. If we compare invertebrates, Ballona has more phyla of invertebrates per one acre of land than any other one acre in Los Angeles County. No other area of Los Angeles has the biological productivity of Ballona. For these reasons alone, Ballona is the crown jewel of biodiversity and productivity for Los Angeles. The abundance of nature overflows at Ballona as nowhere else in Los Angeles. It makes no sense to build on this land to put homes, when its educational value, scientific value, and recreational value is so high, that it is priceless from an ecological point-of-view, but worthless therefore for real estate standpoint. The ecosystem services that the Ballona wetlands provide add up to $billioins of dollars, but only into the millions for real estate development. "The Geography of Hope" for citizens of Los Angeles is many places, but near the top of the list must be Ballona for it abundance of nature. The California State Parks equates to preserving, recovering, and restoring "Wild Nature." Ballona would be best served to the public as a State Park. Let us focus on two birds: Quail and Eagle. 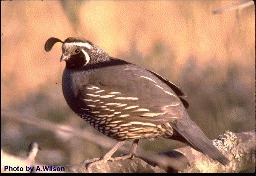 The state bird, California Quail, could be recovered at Ballona quite easily. It can mean recovering the American Bald Eagle back to Ballona, by bringing two-week old Eagles to platforms on buildings, with field biologists and school students as surrogate parents. The Bald Eagle would recover even more quickly if the Sea Otter and Osprey, the two animals it kleptoparasitises fish from are brought back in similar recovery programs. Why is it that an animal that has disappeared from a specific portion of coastal southern California is not considered for recovery, in planning for our coasts, beaches, dunes, prairies, scrub, chaparral, streams, and rivers? For example, the two birds discussed above were once all over southern California. These two birds are our STATE BIRD and NATIONAL SYMBOL! These two birds represent symbols of freedom, liberty, pursuit of happiness, and democracy for all. The only solution is a State Park. Let us all make it happen. Everyone can make a difference. Tell your governor, Gray Davis. And especially tell your local assemblymember and State Senator in Sacramento. 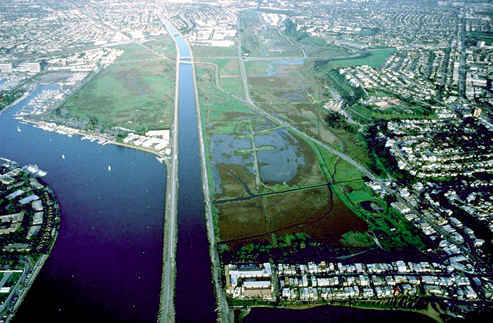 We envision a 1,000 acre Ballona Wetlands State Park!